Local cyclist Brad Ryan will spend most of June biking the Tour Divide mountain bike race that travels along the Great Divide of the Americas. The Continental Divide of the Americas attracts adventurers of all sorts. People hike it, ride horses along it, camp it or just admire its natural wonder. 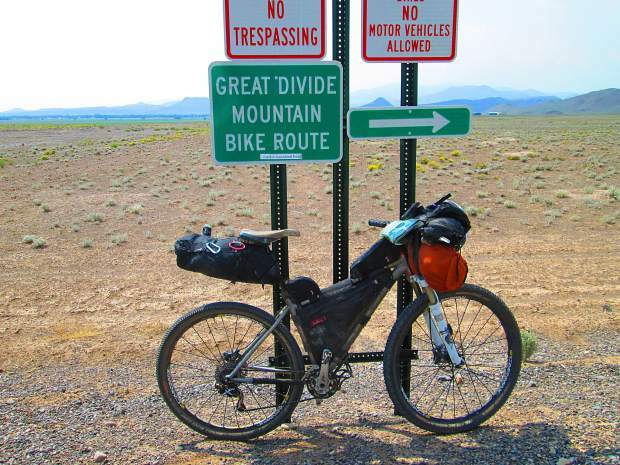 Starting June 9, South Lake Tahoe local Brad Ryan will be biking the Great Divide Mountain Bike Route as part of the annual Tour Divide mountain bike race. Covering 2,745 miles and approximately 200,000-feet of elevation, the race is scheduled to begin in Alberta, Canada and conclude in Antelope Wells, New Mexico. Ryan is originally from Minnesota, but has been living around Lake Tahoe for over two years. The 28-year-old said he took one of his first extensive cycling tours in 2014, after leaving his aerospace engineering job he had in the Midwest. Most of the riders taking the challenge are amateur cyclist, including Ryan. The race attracts riders from all over the world and has been going on since 2008. The shortest time the challenge has been completed was by 2016’s winner, Mike Hall. According to race organizers, Hall finished in 13 days, 22 hours and 51 minutes. According to Ryan, he’s been looking at past races to get an idea as to how to train and how many miles to aim for in a day. He’s been systematic with his training and is biking daily to prepare. Ryan said he will probably ride around 16 hours each day. The race does allow for riders to stop wherever they like as long as it is something that is accessible from the bike route. Ryan said he’s been going over what gear to bring and plotting stopping places. Ryan said as far as other gear, food and clothing, he’s planning on a minimalist approach to save on weight and storage. He has ridden several bikes over the years, but has been working with local bike shops in the area to build a good bike for the race. When the racing actually begins, riders have an array of obstacles to face, including anything from fatigue to mental burnout.